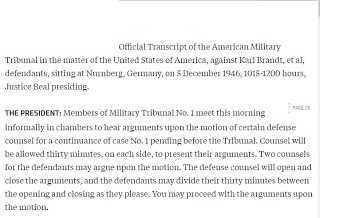 The International Military Tribunal (IMT) and the United States Nuremberg Military Tribunals (NMT) tried Nazi leaders for war crimes and crimes against humanity. 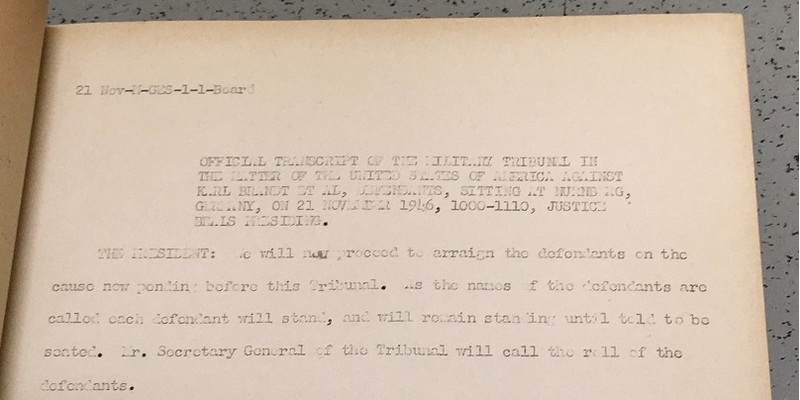 Among other things, the tribunals produced papers—tons and tons of papers. Indictments, transcripts, and exhibits (and translations of indictments, transcripts, and exhibits). The Gallagher Law Library has a large set of the transcripts. Why? 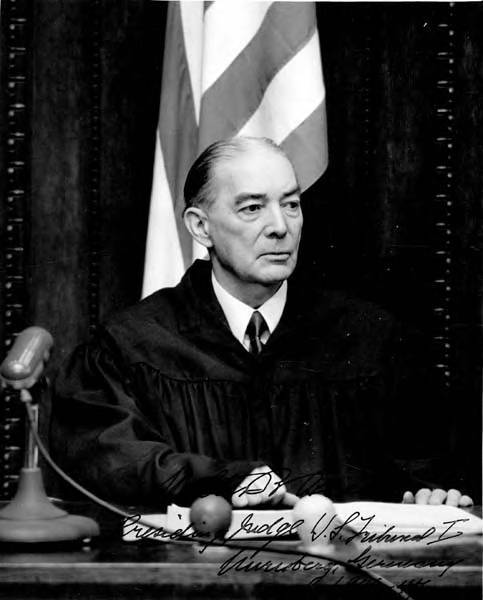 Because one of the judges was Walter Beals, a graduate of UW Law's very first class (1901) and a justice of the Washington Supreme Court, who was called into service as an Army reservist to serve in Nuremberg. Later he arranged for a set of materials to go to his alma mater. Beals presided over NMT Trial No. 1, the Doctors' Trial. Another Washingtonian, King County Superior Court Judge William Wilkins, served in the trial of twelve executives of the Krupp industrial empire for using slave labor and plundering occupied territories. Judge Walter B. Beals, Nuremberg. For more, see The Nuremberg Trials: A Washington Connection, by former Chief Justice Gerry L. Alexander (also a UW Law grad, by the way). Wash. St. B. News, Jan. 2009, at 18-22, HeinOnline link. You can see over 200 more photos in the Walter Beals Nuremberg Trials Photograph Collection, digitized by the University Libraries. And you can read Beals's desk notebook from the trial, which was published in 1985. Our collection of transcripts is a treasure. But it is challenging to use. First, it's huge, and there aren't good maps to help you find you way around it. 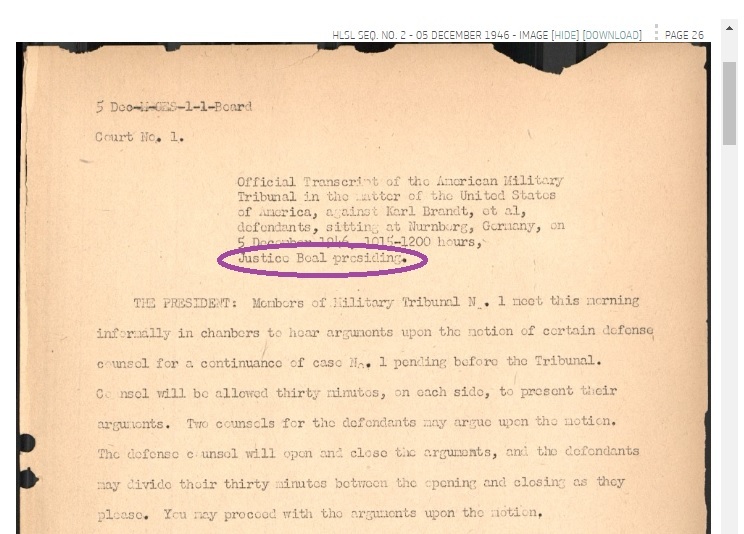 Second, the transcripts are on low-quality, yellowing paper. If the typing was easy to read in 1947, it isn't now. Now the good news: the Harvard Law School Library's Nuremberg Trials Project makes available hundreds of thousands of pages of the trial records, with extras—for example, a summary of the Doctors' Trial. of You can see images of the original, yellowed pages. And you can see (and copy) a nice, clear version of the words that's much clearer. Transcription of the same excerpt. You can see it here. 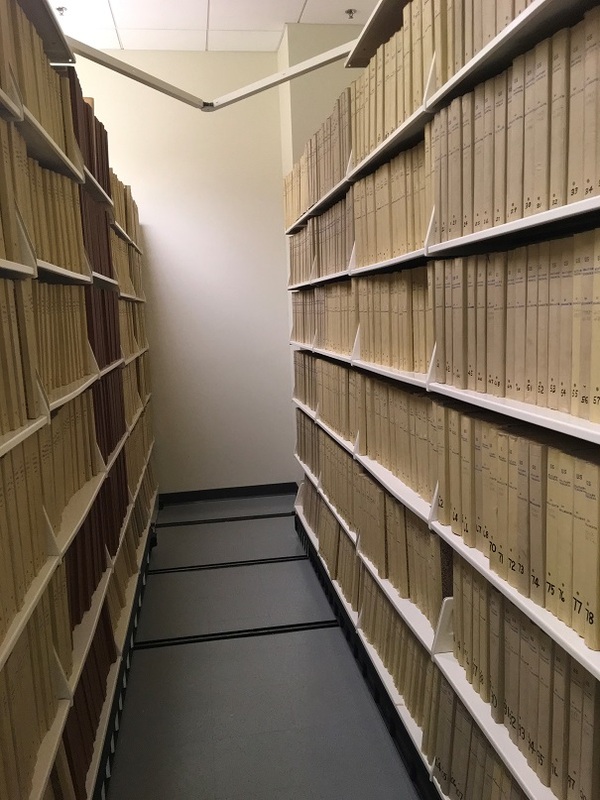 If you're interested in this huge project—20 years (so far), nearly a million pages, 7-12 tons of paper—see Judith A. Haran, The Nuremberg Trials Project at Harvard Law School: Making History Accessible to All, J. Contemp. Archival Studies, vol. 5, article 9. Food Labeling Started Because of...The Jungle?